Just as Humanlight commenced in December, 2013 and the year was ending we got word that WASH now has a. entry on Wikipedia - see our page. Thanks to WASH Board member Phil Kalmanson for taking on this effort and hanging in there thru several seemingly contradictory directions to add or delete details to satisfy the Wiki criteria. We tried not to take it personally. The page is a nice summary place and will perhaps help build the community. It’s much bigger than pages for things like Humanlight. Bu there are still things to do. 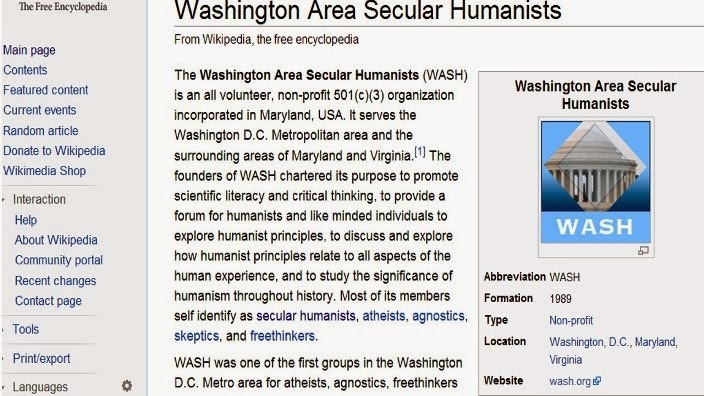 Now that we have a page I added WASH to the list or secular organizations listed under Secular Humanism. Perhaps others will find some things to add and places to add info. Atheists need to assert ourselves! Here's how.